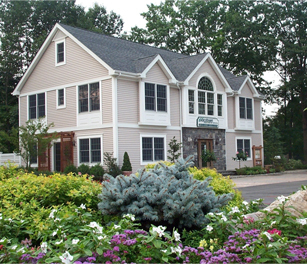 Bergen County, NJ – Jacobsen Landscape Design & Construction has been awarded a 2013 National Landscape Award of Excellence from the Professional Landcare Network (PLANET) for a landscape design & build project in Ridgewood, NJ. The award is presented annually to professional landscape firms who demonstrate a consistent use of quality materials and workmanship for environmental improvement. The busy homeowners desired a beautiful outdoor oasis in their backyard that would provide space for relaxation and recreation for them and their six children. The property features a curvilinear pool with waterfalls, a reflective koi pond, a functional outdoor kitchen, a bluestone patio for entertaining, and a useable green area for recreational play. A spacious, shaded seating area also provides the adults a spot to relax while still be able to engage with children in the pool. A variety of flowering plant material was also used to soften the hardscape areas and add interest, color, and texture. “The challenges of this project were significant,” says Mark Milidantri, the lead landscape designer for the property. “The entire project needed to be completed within a two-month timeframe since the only access we had to the backyard was through the yard of an elementary school.” Nonetheless, the job was completed on time and within budget as a result of careful project management and coordination of sophisticated drainage and pool installation. 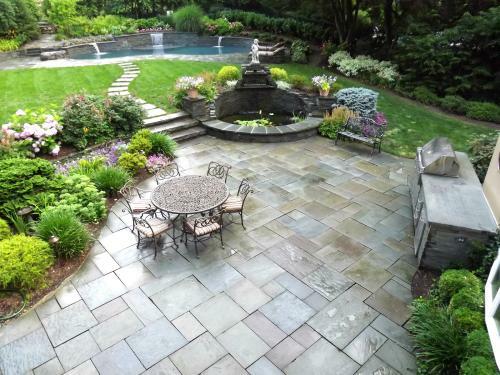 Jacobsen Landscape Design & Construction is an award-winning, full service landscape design firm located in Bergen County, New Jersey. The company specializes in landscape design & build and offers comprehensive landscape maintenance services, including residential and commercial property care, irrigation, garden design, and commercial snow management. The firm has been honored with awards from numerous landscape industry organizations, including the Professional Landcare Network (PLANET) and the New Jersey Landscape Contractors Association (NJLCA). The company was also featured on Home & Garden (HGTV) for its award-winning design for a residential backyard in Hoboken, N.J. For more information about Jacobsen Landscape, visit www.jacobsenlandscape.com. PLANET, the Professional Landcare Network, is the national trade association representing more than 100,000 landscape industry professionals who create and maintain healthy, green living spaces for communities across America. PLANET members are committed to the highest standards in industry education, best practices, and business professionalism. Many of PLANET’s professionals have attained the status of becoming Landscape Industry Certified, achieving the greatest level of industry expertise and knowledge. Visit PLANET at http://www.landcarenetwork.org.